The word essay means “attempt”. It is an attempt at giving expression to one’s ideas on given topic. It is piece of composition on any subject which is lies within the orbit of experience of a person. It is an art or for some people it comes natural, but a person who is not so gifted, can acquire proficiency in it by good and constant practice. A good essay is always divided into paragraph which is so arranged as to form connected piece, make sure your audience will be easily grasp it. Unity – An essay must be written in connected way, developing one theme with a definite purpose. It must ignore all those things which are irrelevant to the theme. It is a mistake to bring in the matter which is of no use on the subject merely to increase the volume. At the same time, the subject may be treated in a variety of ways and from different point of view. Order – The topic of the essay should be treated in a logical and orderly manner so as to form one connected piece, divide it into paragraphs. It should not contain causal and stray reflections jotted down as they come. Brevity and Style – An essay should be neither is too long nor too short. The writing should be simple, direct and clear. The language should not be verbose and involved. It should present a complete idea of the subject and should give all the information that a general reader requires. The Personal touch – The essay should reveal the writer’s own views and opinion or the essay will be colorless. Personal touch will make it lively and looks natural. The reader should find it interesting to go through. Devoid of embellishments and flashes, and a dull and high sounding word usage which is difficult to comprehend will fail to appeal. I. The Introduction – In the introduction, the writer introduces the subject to the reader. He tells him what it is upon, which he is going to write and what significant the subject possesses. It should be written in such a striking fashion as to grip the reader’s attention at once, create such an interest in his mind that he may engaged to read it through. II. The Body – After introducing the subject, the writer enlarges upon it and step by step tells the reader all he has to say. It is the main part of the essay. It should consist of two or three paragraphs each dealing with the main aspect of the subject. The paragraph should be well connected and should have due proportion. III. Conclusion – Last of all comes to the conclusion. It is just as difficult and almost as important as the introduction. The final impression that will be left upon the reader’s mind will be created and determined by the appropriateness of the conclusion. It should be natural and effective, not abrupt or forced. The reader should not get an impression that the writer was intensely forced to end the essay for want of time and space. Descriptive Essays – They describe place, natural scenes, persons, animals, town, cities, village etc. ; The Postman; The Golden Temple; The Sunset; The Village well etc. Narrative Essays – They give an account of an story, an event, the life of a person etc. ; as, The Ramayana; The Battle of Plassey; A journey by train; etc. Reflective Essays – They consist of the considered thoughts of the writer on a given subject or of arguments for and against the subject; as, My aim in life, Honesty is the Best Policy, Thrift, Education, Prosperity brings friends and adversity tries them etc. Imaginative Essays – In imaginative essays, the writer is called to place himself in imagination in a position of which he has had no experience. Such subject as ‘If I were a minister’, or ‘The Autobiography of an earthen pot’, would call for imagination in dialling upon the topic. Expository or Explanatory Essays – They consist of exposition or explanation of such subject such as Parliament, The press, Silk-weaving, Farming, Gravitation, Astronomy, Prose styles, The Genius of Tagore, The Dramas of Shakespeare, etc. One of the chief difficulties a student face in essay writing is the lack of material. So it requires much forethought to write a good essay. The writer should think over the subject for a while and note down all the points and ideas that strike him about it on a piece of paper. Then he/she should construct a mental picture of whole structure and see where each ideas would fit in logically in the best manner possible. He should arrange the ideas accordingly under different headings. Let each principle idea have one paragraph and the ideas which are subsidiary to the principal, be arranged under it. The Skeleton of the essay would thus be built up. Now the writer should fill the skeleton with flesh and muscles by weaving in the ideas into sentences and the essay will be ready in a finished form. After completion, the essay should be carefully revised, correcting all grammatical mistakes and punctuation. It is a person with imaginative turn of mind who can write a good essay. Always write with a neat and legible hand, write short and simple sentences. Difficult words and Flowery language should be avoided. Don’t introduce too many proverbs and quotations. Do not exceed the limit set by examiner, few words more or less, however, do not make such difference. Don’t repeat a same points again and again because, constant repetition will spoil the beauty of your composition. 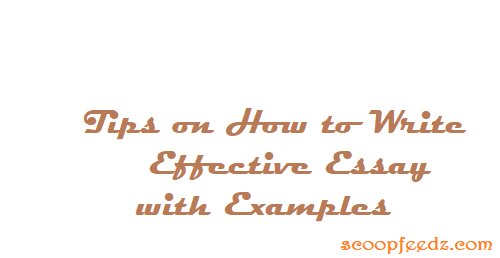 Essay should be divided into paragraphs so that the reader will find it easy to understand.